One easy way to sink your yacht is to neglect the skin-fittings and through-hull assemblies that allow water, vapour or waste to pass in or out through the hull. These assemblies are made up of relatively inexpensive components, all of which steadily degrade – and yet they are underestimated as a potential ‘sinker’ by the majority of boatowners. In the USA it is claimed that through-hull plumbing failures are the primary cause of pleasure boats sinking. Inspecting vessels for insurance or pre-purchase surveys, we frequently encounter owners who pride themselves on maintaining their engines, steering systems, gelcoat and brightwork in tip-top condition; but when we get down in the bilges, we find their through-hull valves are seized and assemblies corroded to the point of collapse. For those unfamiliar with marine plumbing terminology, ‘skin-fittings’ (or ‘through-hulls’, as Americans call them) are the fittings that go through the hull itself. Skin-fittings come in various materials and configurations, but in this part of the world they are more often than not a threaded tube with external flange and a fastening nut on the inside of the hull. ‘Through-hull assembly’ refers to various fittings, such as valves (or ‘seacocks’), hosetails, pipes and elbows, which may be connected to the skin-fitting inside the boat. Traditionally, marine plumbing components have been made of bronze. ‘Bronze’ is a non-specific word commonly-applied to a large spectrum of metal alloys. At the top end are some corrosion-resistant alloys that will last for years; but the word ‘bronze’ is more often used to up-sell household-quality brass. In the marine environment, brass can dezincify at a frightening speed. We’ve seen fittings crumble in the hand during an attempt to operate a valve or unscrew a component from the assembly. Even quality bronze deteriorates under attack from galvanic and stray current, salt water and other corrosive solutions (such as holding tank waste). If your bronze plumbing fittings are black or spotty pink, and/or coated in heavy verdigris or crystalline deposits, heed the warning – it’s time for some maintenance. fitting, drastically reducing its strength in a relatively short time. We often hear people comment that below-waterline stainless steel fails ‘without warning’. Warning signs may well be present if you disassemble components, clean and inspect them carefully – but few boatowners are prepared to go to this trouble. In some countries, polymeric (or ‘plastic’) plumbing fittings are available in a marine grade. On the downside, plastic fittings can suffer from brittleness and UV-degradation; and the plastic may not be resistant to fuel or other waste substances. Depending on size and quality, valves may be ‘flimsy’ compared to metal. Handles need ‘exercising’ regularly to stop them binding. Nevertheless, given the issues commonly encountered with metal under water, polymeric fittings are an attractive alternative – especially for corrosive holding tank waste. On many occasions we have found a plastic valve operating smoothly, while a nearby metal valve of the same age is frozen and degraded. But beware – as a general rule, plastic is a weaker material than metal, and unless a fitting is specifically designed for marine below-water use and approved by a reputable body such as the American Boat & Yacht Council (ABYC), it should be avoided. Approved fittings are not widely available in Singapore, SE Asia and Australia; so many surveyors will condemn plastic plumbing components out of hand, and insist on them being replaced with metal. 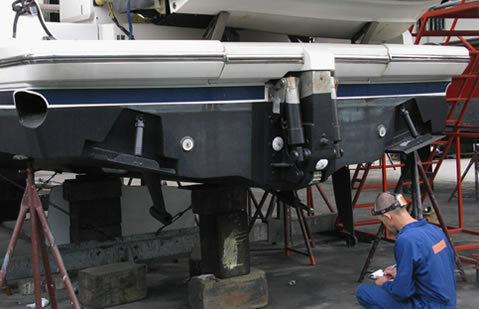 Identify and locate ALL of the skin-fittings and through-hull assemblies inside your yacht. They are easy to find on the outside of the hull, but often get hidden in the bottom of a locker beneath piles of gear. The ones you don’t check regularly will inevitably cause you the most headaches! Inspect all skin-fitting and assembly components regularly. 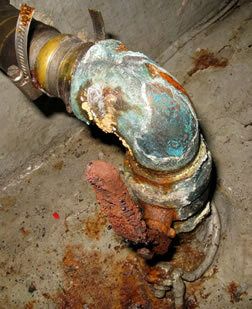 (Note: in warmer waters, corrosion rates are accelerated, so frequency of inspection is even more important.) 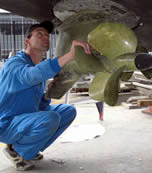 Scrape marine growth and paint away from external flanges, grills and intakes; and inspect surfaces for cracks, pitting or discoloration. Internally, clean surfaces of verdigris, salt deposits, or bilge gunk, so you can check for corrosion. If you have any doubts about a fitting, consult an expert – or replace the fitting. 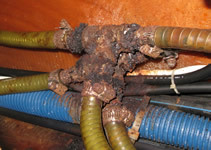 If your skin-fittings are ‘bonded’ (connected by electrical wires to reduce galvanic corrosion), make sure wire connections are clean and secure. Valve handles should be operated regularly, both to prevent seizing and to make sure they are operational. Dissimilar metals should not be mixed within one assembly, nor in assemblies positioned close to each other, as this can cause rapid corrosion in one or more of the components. For longevity, replace any ‘odd’ metal components, so that your assemblies are consistent. Check hoseclamps for condition, fit and adequacy. Below-water plumbing hoses should be secured with two hoseclamps at each connection, preferably wide-band, thick-walled 316-grade stainless steel. The same applies to any continuous flow, high-flow or pressurised plumbing (such as marine air conditioning, fridge cooling, or watermaker plumbing) even if connections are above the static waterline. Vigilance, preventative maintenance, and high-quality fittings are vital in keeping your through-hull plumbing healthy, and your boat safely afloat. © 2018 Niki Perryman, JM Marine Survey. Please note: this article is a brief guide, and is not intended to be a comprehensive overview on the many aspects of marine plumbing. An expert should be consulted regarding individual application.